Thanks to the legend of Dracula, Transylvania remains one of the most famous region of Romania, conjuring up images of haunted forests and werewolves, medieval towns, vampires, dramatic mountains, and turreted cliff-top castles. 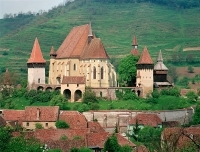 Transylvania is not just about Dracula, however. It contains splendid mountain scenery and alpine peaks, some of the country's best hiking and skiing, rural villages, and a way of life that remains almost as it was in the 18th century. Historic towns are scattered throughout the region, with stone medieval streets, defensive towers, and fortified churches. The charming town of Sighisoara is the most striking introduction to Transylvania, the birthplace of 'Dracula' (a medieval prince, Vlad Tepes, who led the Romanian resistance against the Turks), along with the impressive castles and churches of Brasov and Sinaia, and the dramatic castle of Bran, also known as Dracula's Castle, that looks every bit a vampire's lair with its soaring turrets and dramatic setting. The populace is a mixture of different characters and customs that have been shaped by years of colonisation and the coming and going of different groups, including Romanians, Gypsies, Hungarians, and Germans. Despite the creeping effects of modernisation into the large towns, visitors to this region will be rewarded by its medieval charm and the traditional character of the people. Memories of horse-drawn carts piled high with cabbages, driven by elderly couples with scarf-covered heads and rough hands; lively food markets, quaint cobbled streets, and hilly pastures nestled among the Carpathian Mountains will be the lasting impressions left by the charm of Transylvania.